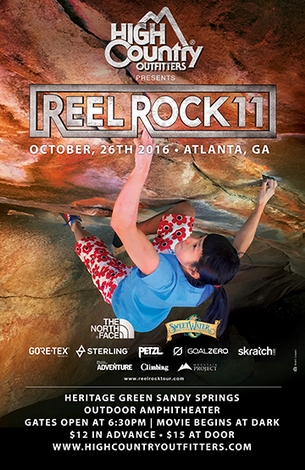 High Country Outfitters is excited to bring The Reel Rock Film Tour back to Atlanta for the 11th year in a row! This year's show will take place in Sandy Springs, GA at The Heritage Green outdoor amphitheater. There is no better way to enjoy a climbing film than the great outdoors! Come prepared with a blanket, and we'll do the rest! As always, High Country and local sponsors are providing some of the best raffle packages you've ever seen! Thirsty? Thanks to SweetWater Brewery, beverages will be available to all movie-goers over the age of 21. This Fall, REEL ROCK cranks it up to 11 with our latest collection of electrifying climbing films showcasing the sport's biggest stories and athletes. The five new films deliver edge-of-your-seat action, globe-trotting exploration, big laughs and true inspiration.